Please fill out the questions below. Once you have submitted the from, we will be in contact with you via email to schedule a time for you to take a photo and pick up your bookstore gift card and gift. The best way to understand the constantly shifting dynamics of the global marketplace is to invest in the global marketplace of ideas this fall through Engineering-LAS Online Learning at Iowa State. Join us LIVE this fall via WebX at 6:00pm starting August 25th. Please see our speaker schedule for dates. Iowa State University’s Engineering-LAS Online Learning system has named its first faculty fellow — Ana-Paula Correia, an associate professor from the School of Education whose research focuses on learning design. The decision to create the faculty fellowship is in part an effort to publicize the success of online education at Iowa State. Engineering-LAS Online Learning oversees the online education efforts of two colleges – the College of Liberal Arts and Sciences and the College of Engineering. Online course enrollment in these colleges is growing by 15 to 20 percent each year, aided by an arsenal of talented faculty members instructing the offered courses. Read more about ELO's first faculty fellow, Dr. Ana-Paula Correia. * Students must have finished their exam and submitted it by the times noted. ** Once the computers shut down they will not be restarted to allow students to finish exams. Students should allow enough time to complete exams prior to computer shut down. *** Weekend hours are limited to the weekend between Dead Week and Final’s Week. Effective February 22 11:59PM, no additional courses for the Spring 2015 term will be accepted by the Testing Centers. You may appeal this decision by contacting Associate Provost David Holger (holger@iastate.edu 515-294-7184 ). 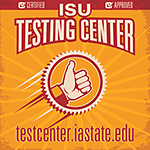 Iowa State is committed to increasing online testing capacity to serve students. In collaboration with the Government of the Student Body we are taking several measures to improve online testing services. A new Testing Center website has been created with complete hours and locations. The Iowa Presidential Caucuses course is the first ever MOOC on the Iowa Caucuses.